Americas Cardroom is making history by hosting the biggest online tournament series by any US-facing poker site in years. 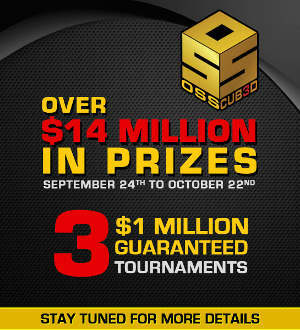 The upcoming Online Super Series Cub3d will run from September 24th through October 22nd and guarantee over $14 million in prize pools over 3 consecutive tournament series. Included are three $1,000,000 GTD tourneys over the final two Sundays. The OSS Cub3d usually features just one $1,000,000 GTD tourney, but ACR added two more for their supersized schedule. They will run on consecutive Sundays, with the first featuring a half-price ($265 buy-in) Million Dollar Sunday on October 15th. The last Sunday of the series (October 22nd) will have another Million Dollar Sundays Main Event ($540 buy-in), plus a $1,000,000 GTD BOSS Main Event with a $2,100 buy-in. The 4-week long tournament extravaganza kicks off with a Mini Online Super Series (September 24th-October 1st), followed by an Online Super Series (October 4th-15th) and then concludes with a Bigger Online Super Series (October 18th-22nd). The three distinct series ensure a mix of buy-in amounts to cater to the bankroll sizes of all players. To reach the $14 million mark, Americas Cardroom has also added multiple tournaments to the schedule, and doubled the size of their regular Big 10 tournaments. While the upcoming focus will be on the OSS Cub3d, players will also have some opportunities to qualify for the 2017 Punta Cana Poker Classic (October 24th-30th) in the Dominican Republic. Sunday night satellites will continue to run leading up to the land-based event, and will qualify at least 10 players each week with a $4,900 package. More details on the OSS Cub3d and Punta Cana Poker Classic can be found at AmericasCardroom.eu. You can find details on the Americas Cardroom bonus code and welcome bonus offer at Americas Cardroom Bonus Code.